I showed my friend Infinite’s ‘Back’ and the one she liked from the MV was Woo-hyun, but when I showed her Weekly Idol the charm of Sung-gyu was too strong. Then, when I asked her why she liked Sunggyu over all the other members she said that,” he’s just so adorable and looks like a hamster.” lol Gifs and pictures not mine. Credit to the owners. 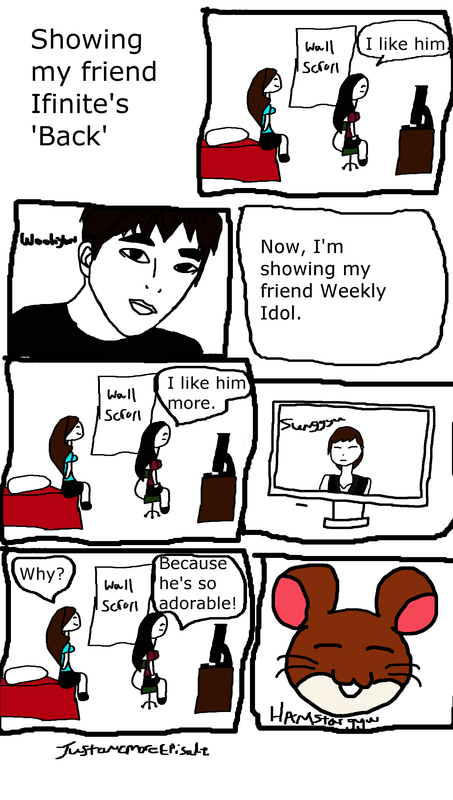 This entry was posted in K-pop comic and tagged Back, Infinite, K-pop comic, Kpop, Sunggyu, Weekly Idol, Woohyun by merryread. Bookmark the permalink.